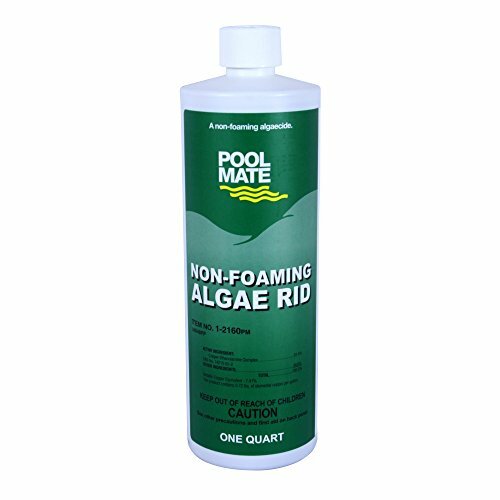 Pool Mate Non-Foaming Algae Rid is a powerful and highly concentrated, chelated copper-based algaecide. Recognized as the strongest non-foaming algaecide for killing and preventing green algae. A fast-acting, high-quality, non-foaming 7.41% copper algaecide, this product eliminates most types of algae without clouding water. the residue stays in solution indefinitely for long-lasting residual effects. Ideal for spring start-up. Swim 10 minutes after treatment. Do not mix this algaecide with soap or other cleaners. Do not premix with other water treating chemicals. These chemicals must be handled separately. Directions for use: Dilute appropriate amount of product with at least nine parts water and pour directly into pool along the edges while the filter and pump are in operation. To allow time for even distribution in pool water, bathers must allow 10 minutes after treatment before entering pool. Initial application: Free of Visible Algae/Start of Season: Apply 2 oz. of this product per 5,000 gallons of pool water (or equivalent) under sunny conditions for most effective results. If Algae Growth is Visible: Apply initial dose, then vacuum pool after 24 hours to remove dead algae. If pool is heavy with algae growth, first brush algae spots, vacuum, clean and scrub the pool walls. Apply initial dose, then vacuum remaining algae debris. Maintenance Dose: Apply 1 oz. of product per 5,000 gallons of pool water (or equivalent) every 5 to 7 days. Note: After heavy or prolonged rainfall, high prevailing temperatures, or heavy swimming use, add the maintenance dose more frequently.